During years of research for their 2008 book Massacre at Mountain Meadows: An American Tragedy, authors Ronald W. Walker, Richard E. Turley Jr., Glen M. Leonard, and their colleagues discovered a great deal of information about the 1857 massacre, leading to a clearer understanding of the tragedy. No one can speak responsibly about the details of this event without consulting these newly discovered documents. 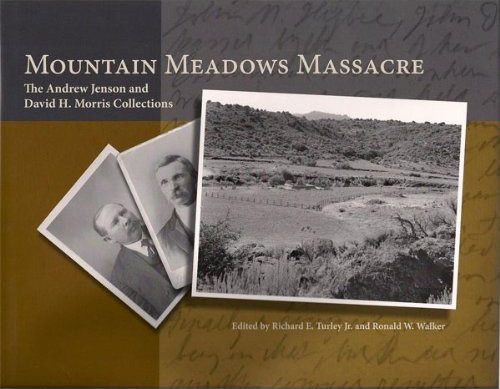 Mountain Meadows Massacre presents two of the valuable and revealing collections the authors uncovered. The first collection was gathered in the 1890s by Andrew Jenson (1850–1937), a full-time employee in the LDS church historian’s office. The second collection was compiled a decade later by David H. Morris (1858–1937), an attorney and judge in St. George, Utah. Images of the original documents are accompanied by typed transcriptions, which reproduce original spelling, punctuation, strikethroughs, and inserted words or characters. Introductory text explains how each document collection was initially created, how the LDS Church came to possess them, and where they were archived. Brief biographical sketches introduce the individuals who were interviewed, gave affidavits, or wrote letters that appear in the document collections. an independent historian, honorary life member of the Utah State Historical Society, and president-elect of the Mormon History Association, is author of At Sword’s Point, Part 1: A Documentary History of the Utah War to 1858.
professor emeritus, Queen’s University, Kingston, Canada, is author of Mormonism and the American Experience. Mountain Meadows Massacre: The Andrew Jenson and David H. Morris Collections is available from the following retailers.